Michael Season's re-branding features a sun shining from the back of the new logo. This shines over a glorious countryside. But all of this is background imagery, which works very well. If anything, it enhances the Kettle Cooked label and color coded flavor band at the front. The design does all it needs to - It pops the logo, it has a traditional but modern feel, it differentiates the flavors colorfully. It even highlights the reduced fat aspect. The light colors even make it all feel healthy. Lacking in visible oil, the thickness of these Chips aided the crunch, which featured Chips crushed under the weight of pressure rather than in in the face of the slightest chomp. 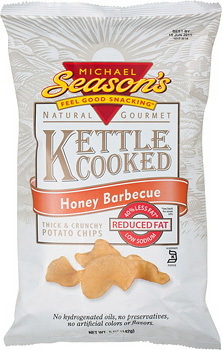 These were irregular shaped Kettle Cooked Chips. Some were folded, some were curly wurly. There were lots of oil bubbles, which created a rough and ready texture. There was also a thick coating of orange seasoning powders. In this case, reduced fat may have contributed to the lack of flavor. There was definitely a vinegary barbecue taste, but it was very tame. There was no heat and very little sticky sweetness.